Another beautiful morning to paint outside, and good timing because I was not thrilled with my last dripping paint results. Things are looking much better today though. I mixed pink and red with a VERY small amount of blue to get fuschia. If you put in more than a drop of blue, you will get a lovely purple, but that is not what I was going for here. Then I mixed blue with a very light torquoise and a more green torquoise to get the torquoise-blue color. I mixed both colors right in a squirt bottle and added water to thin the paint. I hung my fabrics, sprayed them with the hose, and proceeded to drip the paint. After applying all the paint, I lightly misted the fabric to enhance the flow of the colors. I painted a second piece using the fuschia already mixed and an orange mixed from yellow and a SMALL touch of red, same process as above. The three primary colors, red yellow and blue, can be mixed endlessly to produce new colors, some shown on the color wheel in my last post. Fabric paint can be mixed in a container (as done for the color wheel) or directly on fabric. This is the first experiment with mixing transparent paint on fabric. I used ProFab Textile paint on unbleached muslin. It may be difficult to see the subleties in the color changes, but I will explain, and you can try these explorations on your own. I started with wet fabric because I love the blending that occurs. 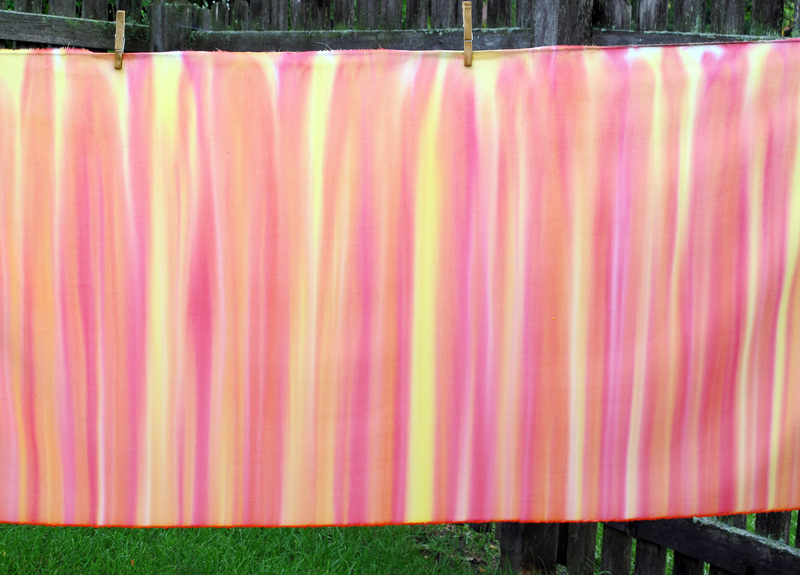 The first 3 strips of color are dry (paint straight from jar) on wet(fabric). The last 3 strips are wet (diluted paint) on wet (fabric), and there is very clearly more blending when using “wet on wet”. FIRST STRIP on the left: Layer 1 is yellow. Layer 2 has red over the yellow resulting in a red-orange hue; the red, though darker than yellow, is transparent enough to allow some yellow to come through and blend. Layer 3 has blue painted over one layer of yellow, resulting in a blue-green hue. SECOND STRIP: Layer 1 is red. In layer 2, yellow is painted over red, giving an orange hue; painting yellow over red produces a lighter orange than painting red over yellow (1st strip, layer 2). In layer 3, blue is painted over the second layer of red and yellow, resulting in a brown hue from blending of all three primary colors. THIRD STRIP: Layer 1 is blue. In layer 2, yellow is painted over blue, resulting a green hue. In layer 3, red is painted over blue, producing a violet hue. Looking at the right half of this fabric, first notice the difference between the left side and the right side. The left half was done with “dry” paint (right out of the jar) on wet fabric, producing some blending due to the wet fabric. The right half was done with wet paint (water-diluted) on wet fabric, producing even more blending. Diluting the paint with water causes spreading and bleeding (think watercolor); colors mix, creating new colors. In addition, you can see that the colors, being diluted, are lighter in value than the deeper hues on the left. 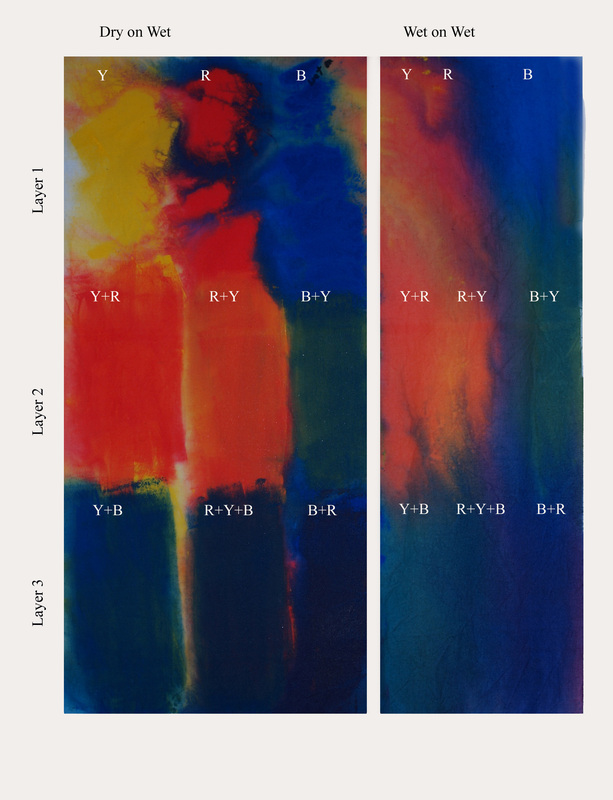 The same color sequence was used for the set of strips on the right, this time wet/diluted paint on wet fabric. 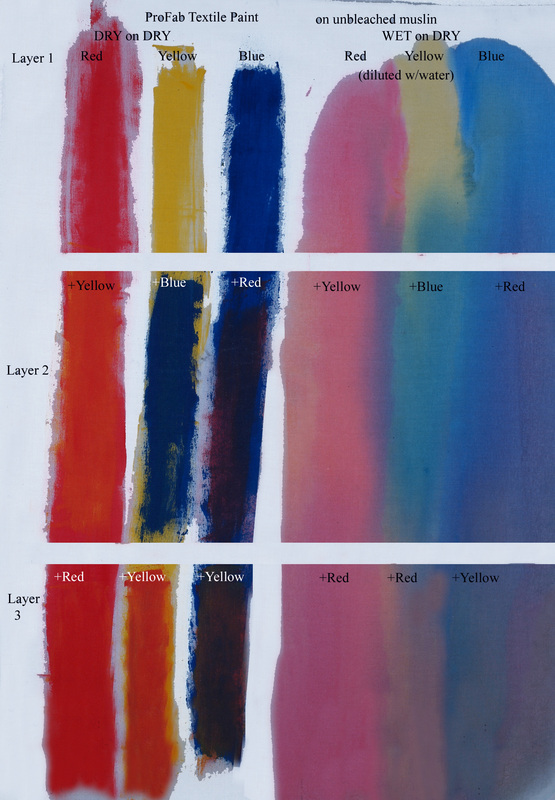 Working with “wet on wet”, there is so much blending, it is hard to differentiate between the 3 strips. FIRST STRIP, right side: Layer 1 is yellow, layer 2 has added red, and layer 3 has added blue. Similar to the “dry” results, layer 2 has a red-orange hue and layer 3 has a blue-green hue. SECOND STRIP, right: Layer 1 is red. Layer 2 has yellow painted over red, producing an orange hue. Layer 3 shows yellow painted over the orange, resulting in a blending of the three primary colors which produces a brown hue. THIRD STRIP, right: Layer 1 is blue. Layer 2 has yellow painted over blue, producing a green hue from the blending of yellow and blue. Layer 3 has red painted over blue, resulting in a violet hue. You can begin to appreciate some of the different results that can be achieved when using wet vs dry paint, using wet vs dry fabric and depending on which color is put down first. The next exploration will be with dry fabric.